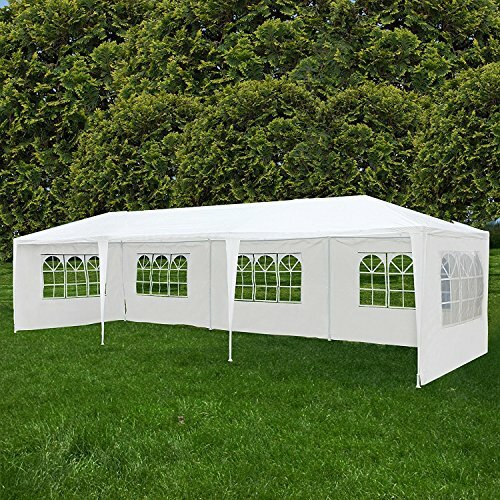 You are viewing our Uenjoy premium quality tent, which is perfect for all your upcoming outdoor activities, ideal for commercial or recreational uses such as weddings, school events or parties, camping, and garage or yard sales, trade shows etc. With the latest design & durable Material, this gazebo will be your best choice. The gazebo is not designed as the permanent structure. Please DON'T use it under extreme/bad weather conditions or for a prolonged period of time. Product Size: 3m(W)*9m(L) / 30' x 10'. Made by Uenjoy top grade Material (Polyethylene & Stainless Steel). Durable, rust / corrosion resistant & water proof. Latest design. All accessories included. No tools is needed. Very easy to set up. Comes with PE joint fittings, ropes and stakes for added stability. Product Size: 30' x 10' / 9m x 3m. With 8 Sidewall. Note: The gazebo is not designed as the permanent structure. Please DON'T use it under windy, extreme/bad weather conditions or for a prolonged period of time.